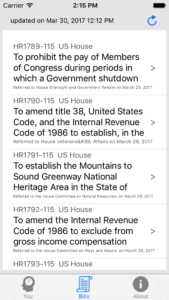 The Government Looking Glass, a universal app for your iPhone or iPad , rates your legislators against the issues that you care about. You chose whether you support or oppose 20 different issues as well as how strongly you care about the issue. 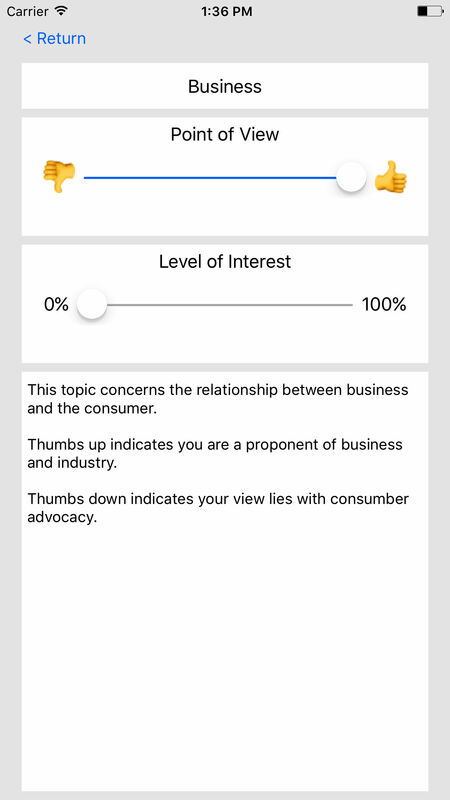 Using 100s of existing ratings from a wide variety of special interest groups, the app determines an overall score. You can review the score as well as each of the ratings. But it doesn’t stop there. 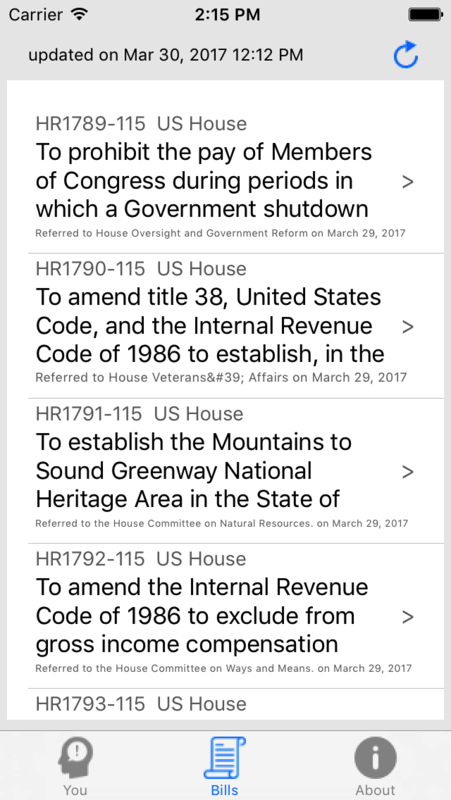 The Looking Glass also provides a listing of the current legislation going through Congress. 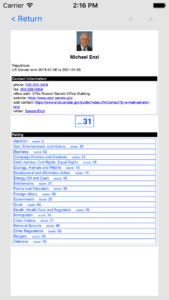 You can look at the details of any of the bills as well as easily reach out to your Senator or Congressman to let them know how you feel. 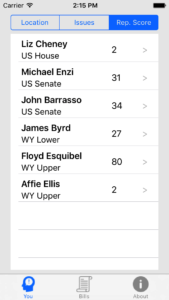 Culling various databases, the Looking Glass provides a clear view of your representatives. With a single touch, you can select your location. 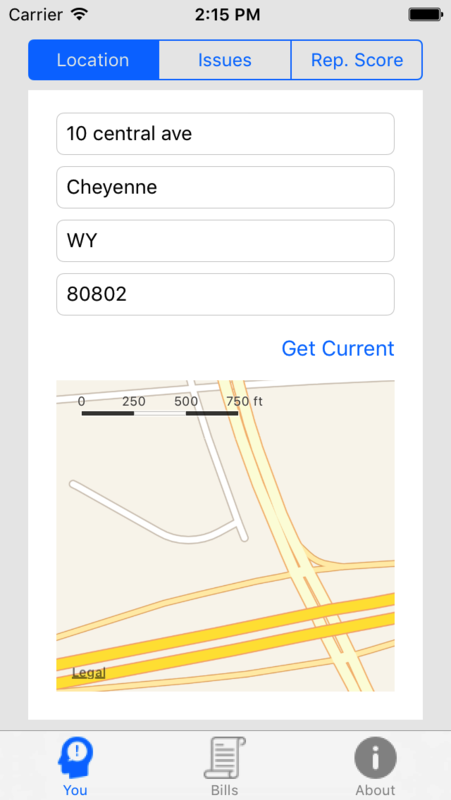 The application will take that location to determine your federal district as well as your federal and state representatives. Feel free to change the location, to see how other representatives align against your view points. Through the issues screen you can indicate your viewpoint on a variety of topics. Not only can you indicate how you feel, but whether you care about a particular topic. The application will ignore any issue that you have no concern. 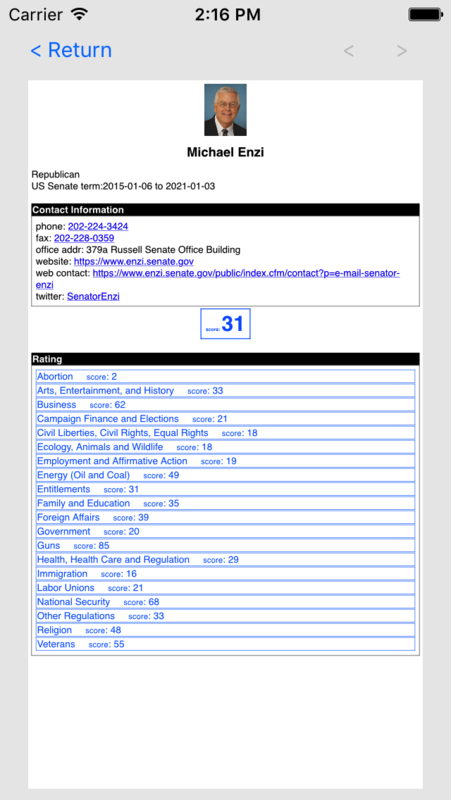 The application combines the legislator ratings from special interest groups with your view points. It then instantaneously generates a score based upon how closely those ratings align with your view points, all weighted against the level of concern that you had for the topics. If you’re curious about how the score was derived, you can select the representative and see all the details that went into the calculation. 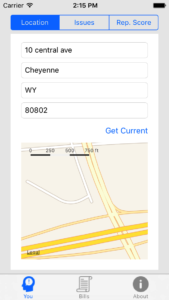 Plus, you also get contact information as well as their website. 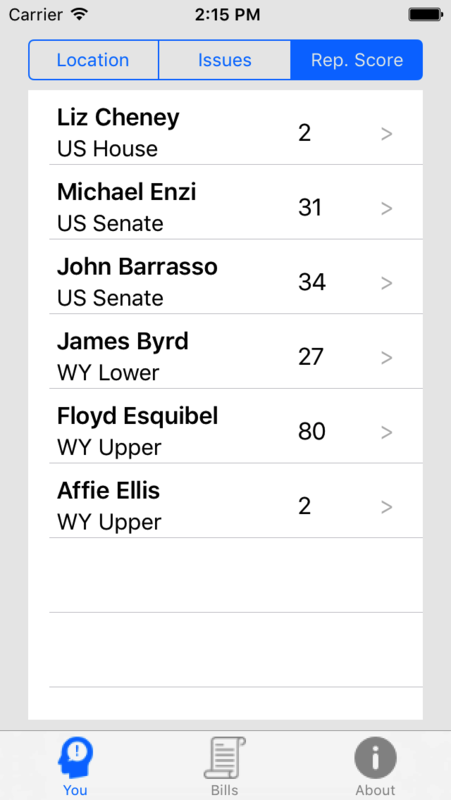 In addition to analyzing your legislators, the app provides a listing of the current activity in the US Congress (both House and Senate). You can review the details of any Congressional activity and then quickly reach out to your representative to let them know how you feel. 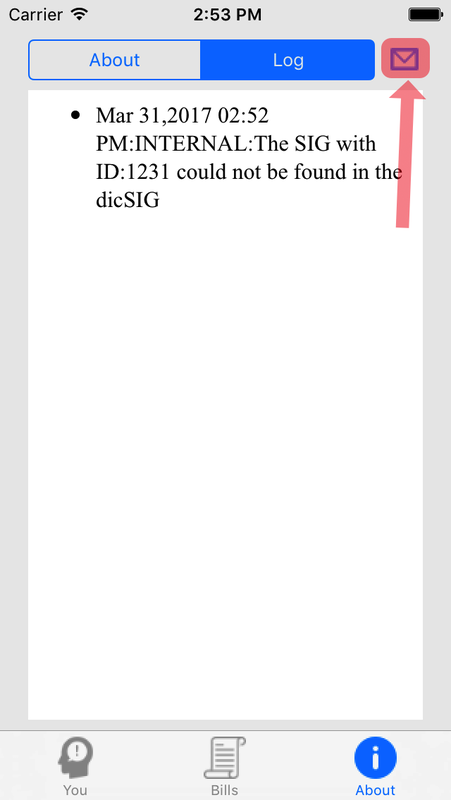 Why doesn’t my legislator show any score? 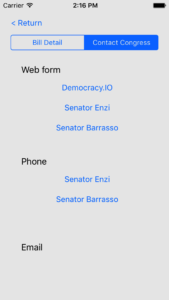 Most likely the data received by the application is missing the VoteSmart identifier. Incomplete/outdated data can occur within the databases used. Please take a look at the Log screen on the About tab (see below). There is a button to send the log to us. We’ll be able to make corrections in a update. 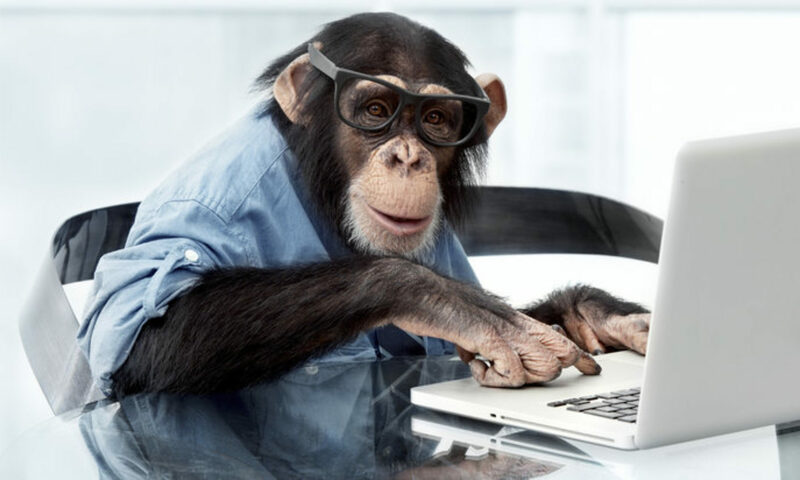 Over the years, much of the Congress have stopped using public email addressesand started to direct communication through web pages. 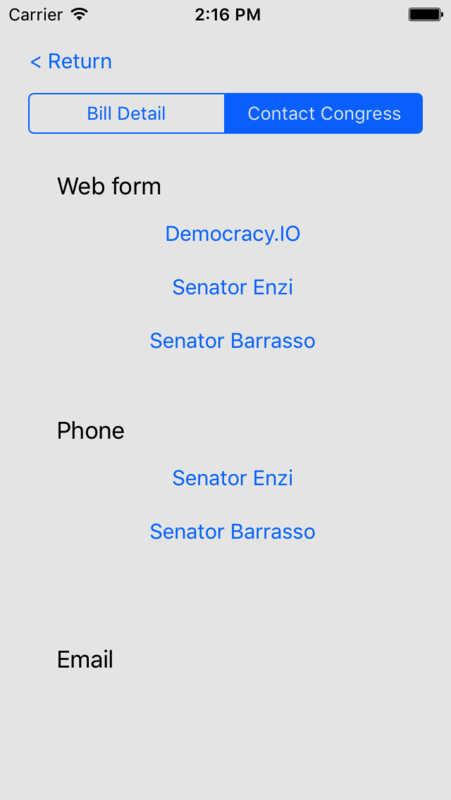 In addition to providing the various web pages,the application also provides access through Democracy IO, which gives you simplified way of using those web pages.